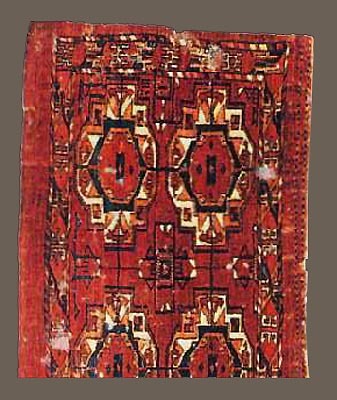 The Seljuk minor border seen above is very rare and dates to the end of the 13th century, plate # 9, Yetkin, Historical Turkish Carpets. The Seljuks were a Turkoman people who in the eleventh century conquered Iran and made Isfahan their capital. In the thirteenth century they also controlled Turkey. The minor border seen in the Seljuk fragment above may represent a purely Turkoman design. 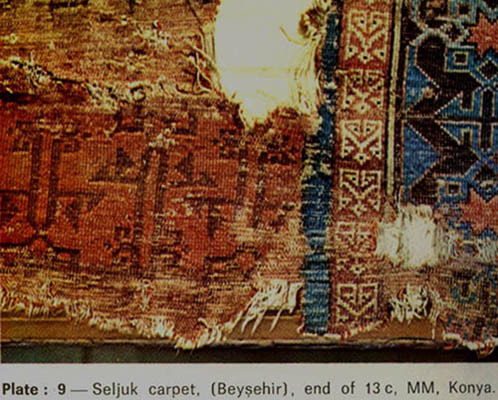 The Ersari border seen to the right of the Seljuk fragment seems related to it. What relationship did the earlier Seljuks have with the later Ersari? The Salor were blood kin or babadash with the Ersari during the classical period. The Ersari weaving seen above is from the collection of Kurt Munkcasi. An analogous though simplified border was published in Hoffmeister’s, “Turkoman Carpets in Franconia” plate # 25. The Tekke torba, seen in part above, has been C-14 dated to the 16th century and its border design represents stylistic continuity over a span of three hundred years. The Tekke torba presented above is turned ninety degrees to normal. The horizontal border segment contains a repeating design that represents a simplification of the Seljuk border seen in figure one above. The Seljuk minor border design has been reflected and rejoined in an evolutionary process of design mutation. The design in the vertical segment of the Tekke border is a further simplification of the motif. This Seljuk inspired design seen in Hoffmeister’s Tekke torba basically disappears after the 16th century and only reappears in degenerate forms in later Turkoman work. It is interesting to note that Hoffmeister’s Tekke torba hails from the sixteenth century, the last century of the greatest period of Turkoman prestige and power. The seventeenth century was one of near continuous drought when the Turkomen witnessed the drying up of their main river, the Uzboy. Towards the end of the seventeenth century the Turkomen were fleeing their Caspian environs towards the Khanate of Khiva. There they existed around the periphery of the Khivan Uzbek Empire fighting for the Uzbek Khan and with each other over water and pasture rights. The process of migrating away from the drought and destitution attending the Eastern shores of the Caspian Sea must have begun earlier than the late seventeenth century. The border found on Hoffmeister’s sixteenth century Tekke torba is rarely seen in later Turkoman work and never seen in that exact formulation again. I collected a mid 17th century Tekke chuval, Ghereh # 18, and its iconography was almost totally Salor. It seems reasonable the weaker Tekke would have succumbed to the Salor during the hard times of the 17th century. Tekke men would not have been readily accepted by the Salor and you can bet that as many of them as could migrated. The picture above shows a border similar to the one found on Hoffmeister’s early Tekke torba. A segmented box with upraised arms surmounted by triangular barbs gives this border resonance with the thirteenth century Seljuk minor border first pictured. 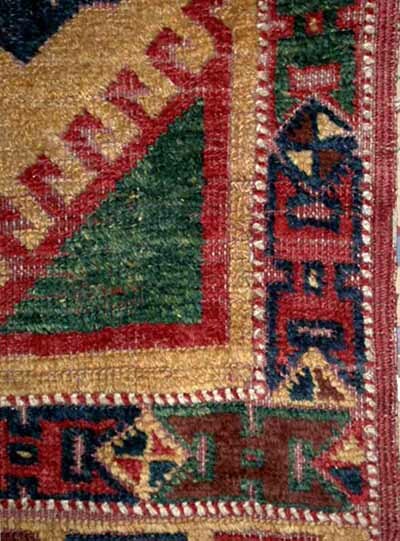 The central design of the yellow ground eastern Anatolian weaving pictured above is stylistically related to the Turkoman gull pictured beside it. 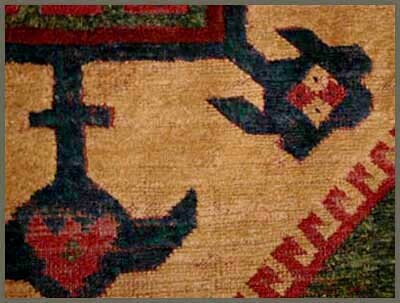 The Tekke main carpet gull is derived from the archetypal Arabatchi main carpet gull. 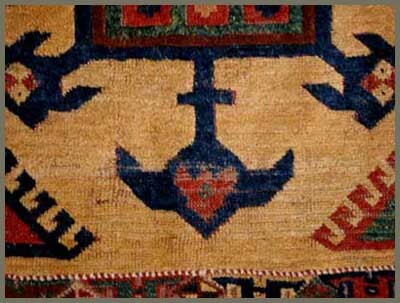 The best known example of an archetypal Arabatchi main carpet gull is found on the Ballard Arabatchi chuval at the Metropolitan Museum of Art; see figure 54 in “Turkmen” by Mackie and Thompson. The North-South and East-West axes of the ‘gull’ dominating the field of the Eastern Anatolian weaving above are clearly related to the Arabatchi gull’s corresponding axes. The diagonal motifs however cut an entirely different space and subtend an entirely different meaning. The Arabatchi gulls diagonally arranged elements of design seem to represent a face with pointed cap. The eyes, ears, and nose of this ‘hidden’ Arabatchi face are represented by pointed lance like devices. The face is being ‘informed’ by sacred birds with calls in one ear and images in the opposite eye. This is a powerful metaphoric statement and indicates the nomadic Turkomen had ‘aerial reconnaissance’ mediated to them through their birds of prey. No wonder nobody could find them in the desert. They were birds of prey. 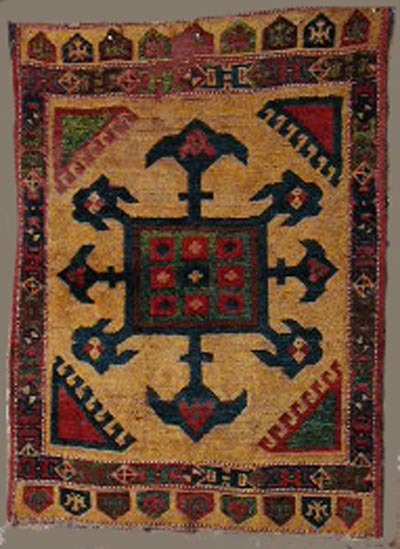 The border of the yellow field Anatolian rug is quite similar to the one found on the Hoffmeister torba, pictured above. The large gull filling the Anatolian rug’s entire field is similar in spirit to the archetypal Arabatchi main carpet gull. I conclude the inspiration for the Anatolian weaving came from an injection of Tekke refugees into eastern Anatolia in the early seventeenth century. Each diagonal motif in the Anatolian weaving pictured above helps fashion the negative space surrounding it into a bellicose and fearsome image, a raptor with talons digging into an enemies face while tearing at the neck with its scimitar like beak. The three lance like devices composing the hidden face in the archetypal Arabatchi gull are reduced to three small lobes radiating from a carefully fashioned diagonally arranged motif in the Anatolian rug’s design. 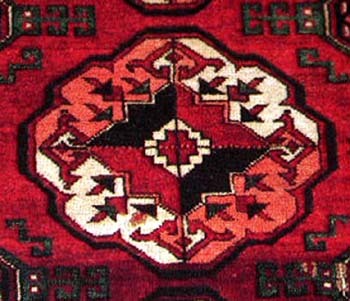 Each small lobe radiating from the diagonally placed form in the Anatolian rug’s gull is critical to the negative yellow ground space it punctuates. The overall impact of the negative space patterns would be destroyed by merely removing the bar across the shaft of the designs at the vertical and horizontal extremes. There are absolutely no frivolous or accidental aspects in this rug’s design. Visually combining the two inferior quarters of the Anatolian gull, an image appears of a brooding shaman perhaps with horns on his head. The psychological affect of this shamanistic figure is similar in affective presence to the corresponding portion of the Arabatchi main carpet gull. There must have been Arabatchi main carpets in the sixteenth century with their own tribal gull. They may have had a more elaborate rendition of the border found on Hoffmeister’s sixteenth century Tekke torba or possibly a border more like the one seen on Kurt Munkcasi’s rug. Hopefully an example will eventually come to light. The true age of the yellow field Anatolian weaving shown above will have to wait on scientific testing but stylistically it is most likely an early 17th century rug. The evidence seems to indicate a slow but steady migration of Turkoman clans out of Central Asia into Anatolia in the early seventeenth, mid eighteenth, and late nineteenth centuries. I have recently discovered another yellow ground Konya rug about the same size as mine that I date to the mid 18th century; Sotheby’s, New York, Fine Oriental and European Carpets Sale, N07749 lot #59. This rug also has strong Turkoman resonance so I think it is fair to say that everywhere the Turkoman refugees went they encouraged stylistic changes in the local stylistic repertory.